There is no doubt that chrome is the fastest Internet browser when you use it on your PC. Many people all over the world love this amazing web browser. But, when we consider it as a smartphone browser, we try to speed up Chrome browser on Android devices. It is one of the best browsers available on the play store, but sometimes it acts lagging issue. There is no browser for Android that competes with Chrome because it provides a high-quality user experience like your computer browser. Chrome is clean, reliable, and syncs perfectly with your Chrome desktop browser. A smartphone with low RAM or slow Internet bandwidth might cause a lagging issue. That’s why people with slow Internet connection prefer to use other browsers like Opera Mini, UC browser, etc. People, who would want to use it as a primary browser like the computer, they should try these simple tweaks to speed up chrome browser on Android. Why Chrome Lags a Lot on Android? Google chrome is the pre-installed and user-friendly web browser for Android devices. By default, it comes with 64MB of limited RAM using capacity. When you open multiple tabs in Chrome, it slows down due to the shortage of memory. If you’ll assign a higher memory use, then it’ll run smoothly. The second reason is, Chrome allows the user to take the full benefits of web browsing like a desktop browser. That’s why it runs each and every element on a webpage. So, it takes more time to load in a slow Internet connection. There are two easy ways to increase the browsing speed and RAM limit on Chrome for Android. Apply the below steps and enjoy a better web experience on your smartphone. This tweak only works with the old versions. 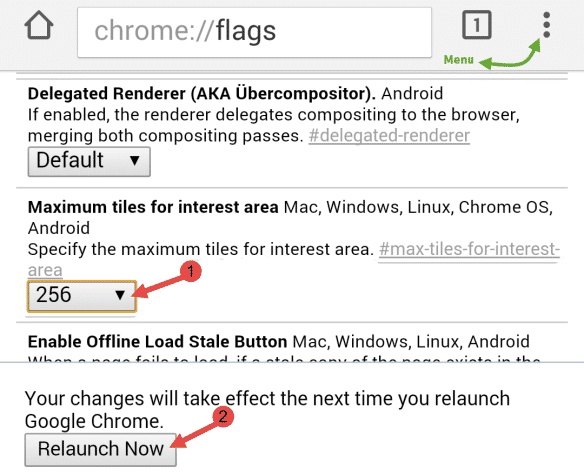 You can easily increase the chrome speed with flags. If you don’t know about flags on the chrome browser, then let me explain it. Flags are the experimental hidden features of Google’s chrome to enhance your user experience. Let’s know how it works? 1) Open Google Chrome browser on your Android Device. 2) In the Address bar, type chrome://flags and hit enter. 3) This will take you a hidden menu with lot of settings. 4) Now go to Menu >> Find in page. Here search for tiles. 5) In Maximum tiles for interest area, you’ll see a Default option. 6) Now update it to 256 or 512. 7) It’ll ask you to re-launch your browser. That’s it. 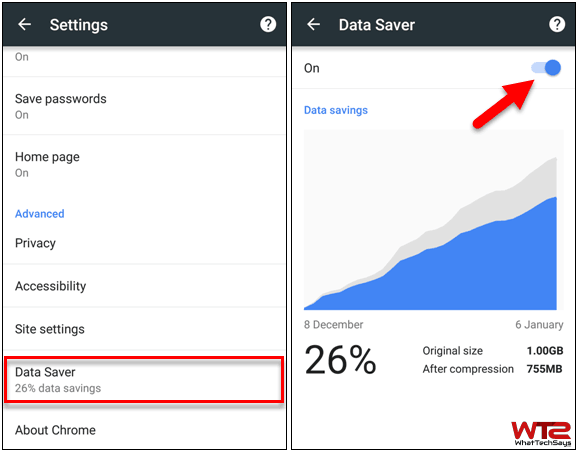 You might not know, there is a “Data Saver” option on Chrome on Android. Basically, it compresses the web elements and provides a better and faster web page loading experience. This feature is also available on your computer browser as a beta stage. Follow the below steps to enable it on your smartphone. 1) Open Google Chrome on your Android device. 2) Tap on 3-dots Menu button and select Settings. 3) Scroll down and tap on “Data Saver” option. 4) Now, Enable it and you are done! In this way, you can easily speed up Chrome browser on Android devices. If you’re a new Android user and don’t know the hidden secrets of Google Chrome browser for Android, then don’t worry about that. This simple trick can help you a lot to increase your browser speed with better page loading, scrolling and navigation even in multiple tab browsing. Try it now and share your point of view with us.